Upper Hellesdon smock mill stood to the east of the Aylsham Road at the end of a track. The 5 storey mill used patent sails to drive 3 pairs of stones. The brick base went up to the level of the stage. In 1828, the grinding capacity of the mill was given as 6 lasts i.e. 120 coomb sacks per week, which equates to 40 coombs per week per pair of stones. With Possession at Michaelmas next or sooner if required. A Capital TOWER WIND MILL, Brick and Timber built, with Patent Sails and driving three pair of Stones. The Machinery of every description in this Mill is in excellent condition and new within a very few years, and she has the advantage of about one acre of Land attached. The property is situated within a mile of Norwich, in a populous and increasing neighbourhood; and the Land is a most eligible spot for Building purposes. The only outgoing is a Land-tax of 9s. per annum. For price and particulars, apply (if by Letter postage paid) to Mr. Peter Day, Solicitor, Upper Market, Norwich. A Capital TOWER WIND-MILL Brick and Timber built, with Patent Sails and driving three pair of Stones and capable of Manufacturing about six Lasts of Corn per week. The Machinery of every description is in excellent condition and new within a very few years. There is about one Acre of Land attached to the Mill which will be comprised in the purchase. The above Property is all Freehold and situate within a mile of Norwich in a populous and increasing neighbourhood and the Land forms an eligible spot for Building purposes and the only outgoing is a Land tax of 9s. per annum. Part of the Purchase Money may remain on Mortgage if required. Apply (if by Letter postage paid) to Mr. Peter Day, Solr. Upper Market, Norwich. A Capital TOWER WINDMILL situate in a populous neighbourhood in the vicinity of Norwich with nearly an Acre of Land attached all Freehold and the outgoings are moderate. The Mill will manufacture five Lasts per week and to an industrious worker miller is altogether a desirable concern. A small capital will surfice as a considerable portion of the Purchase Money may remain on Mortgage. Apply to Mr. Peter Day, Solr. Upper Market, Norwich. The mill was marked on the 1834 map. John Hill was the miller in 1836 and the mill was also marked on the 1838 map. Charles Bensley was the miller from 1839 to 1845, followed by James Capon, who had previously been at Catton towermill, until 1848. The mill was for auction in December 1848. To be Sold at a very low price. Within one mile of Norwich. A Capital TOWER WINDMILL erected within a few years, with Patent Sails and driving three pair of stones and capable of manufacturing about 6 lasts of corn per week. Attached to the Mill is about an Acre of excellent Land well adapted for building purposes. All Freehold and the only outgoings a Land tax of 9s. per annum. two thirds of the Purchase Money may remain on Mortgage. Applications to Peter Day, Solr. Upper Market, Norwich. A very desirable Tower WINDMILL with all hert Going Gear in excellent repair, driving three pairs of stones, in the vicinity of Norwich, with House, Garden, Granary, Stable and suitable conveniences. Apply to Mr. Charles Bensley St. Stephens personally or by letter post paid. N. B. The present occupier is declining business. 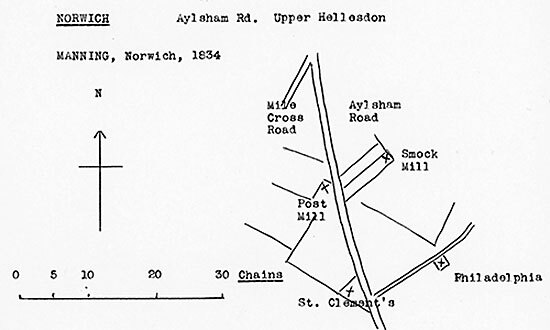 A Plot of Land at Hellesdon near Norwich containing 3r. 15p. or thereabouts with an excellent brick and board TOWER WINDMILL Driving three pairs of stones, with five floors, patent sails, spacious granary, cart lodge and stable. Also a Brick and Tile built Cottage. All in the occupation of Mr. James Capon who is under terms to deliver possession to the purchaser. Freehold. Land Tax 9s. per annum. NB. The Implements in the Mill to be taken by the Purchaser at Valuation. Apply to Mr. Feake Sanford, Solr. 20 John Street, Adelphi, London or to Mr. Butcher, Auctioneer, Norwich. Timothy Baker was the miller from 1854 to 1856. He was born c.1792 in Beeston, Norfolk and had previously been a corn merchant’s agent. In 1856 Henry Bond, who came here from Bond’s mill, Sprowston_towermill, took the mill. He died on the 13th February 1860. On Monday last, Mr. H. Bond, sen., miller, Hellesdon, late of Sprowston. His widow, Martha and two of her sons, William George and Henry, who was known as Harry, then ran the mill. William George Bond left the mill in 1871, taking the New_Catton_towermill on St. Clement's Hill. Harry Bond continued to run the mill. He was married in September 1873. BOND – JEFFRIES. – On the 30th ult., at Hellesdon, by the Rev. C. A. Hope, Henry Bond, miller, to Hannah, fourth daughter of William Jeffries, farmer, both of Upper Hellesdon. Henry Bond was given in Hamilton’s Directory of 1879 as at the Tower Mill Upper Hellesdon. In 1881 he was given as a miller aged 38 living at the mill & dwelling house, Hellesdon with his wife Hannah (28) sons Henry W. (4) and Charles F. (3) and daughters Gertrude (6) and Emma (1). He was listed in Eyre’s Directory of 1883 as a miller at Aylsham road. The mill was marked on the 1884 map. In 1885 Henry Bond was elected one of the overseers for Hellesdon. 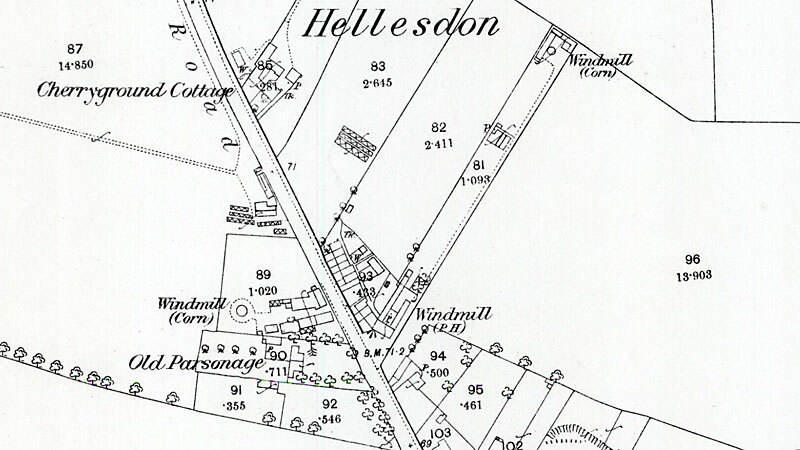 Henry Bond was listed in White’s Directory of 1886 as a corn miller at Hellesdon mill, home Upper Hellesdon Road. He was at the mill until 1888, in which year the mill had a steam engine and Mrs. Hannah Bond followed him until at least 1890. The mill was standing in 1897 and Harry Pointer demolished it later. A round building was marked on the 1907 and 1914 maps – perhaps the base was left standing as a store when the mill was demolished.